gluing the fixed shelf between the two side panels (A), Then add the top (C) and bottom (D) pieces. Center the divider below the fixed shelf and screw it in place with counter-bored screws. Fill or plug the holes. To allow for ventilation and room for the television to extend outside the cabinet (if necessary), cut a 24" square opening in the back (E), 29" up from the bottom edge (Fig. 2). Cover the divider with a shortened divider cap (I). It should fit between the bottom (D) and the fixed shelf edging (11). 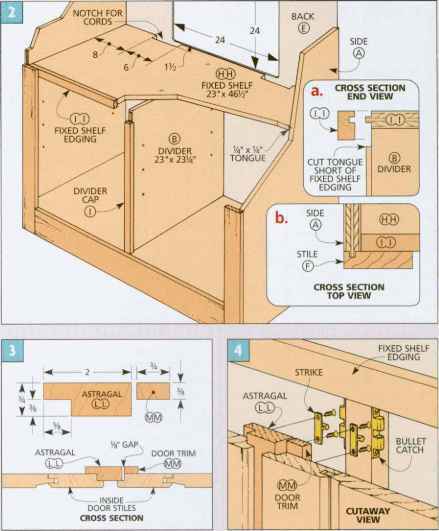 Proceed with construction of the cabinet, but build the base 4V2" deeper (parts 0 and Q).Then add 4V2" to all of the side moldings (K, M, T, V). (he back of the left door (Fig. 3). A rabbet cut in the astragal mates with the rabbet in the door. To allow the door catch to mount 011 the same plane for both doors, glue a %"-thick piece of door trim (MM) to the back of the right door (Fig. 3).